Photos by Ian Cruickshank (bottom right) and Kelly Fretwell. 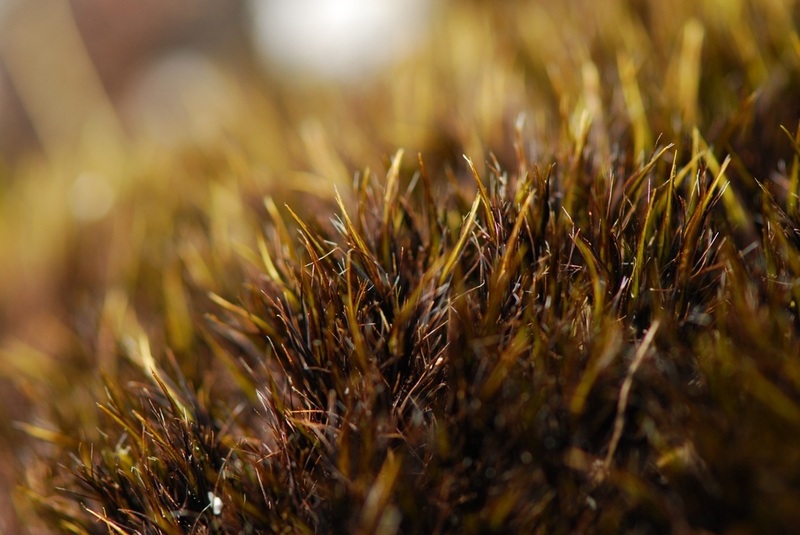 Black fish hook moss has greenish-black to golden brown plants that grow upright to 1-5 cm tall. The stems are usually unbranched and bear reddish filaments. The leaves are narrow, lance-shaped, and and concave in cross-section, with wide midribs that take up nearly the entire width of the leaves. 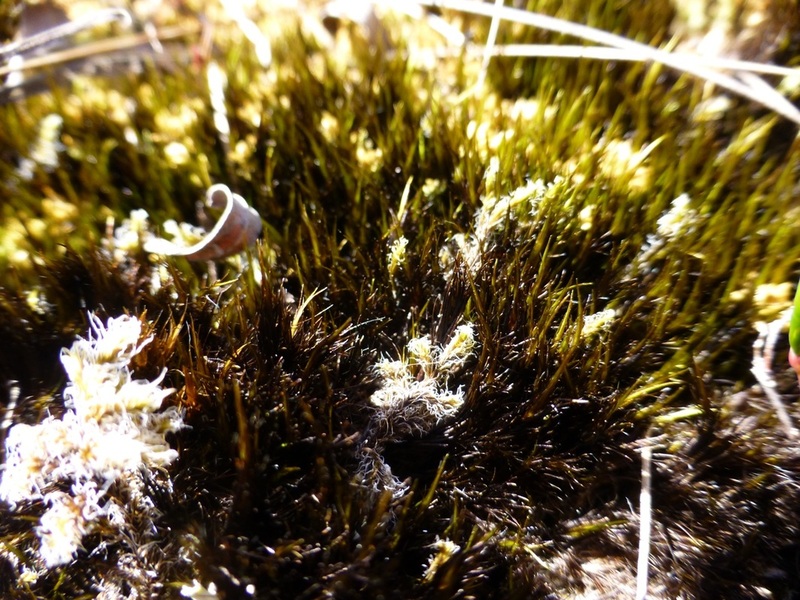 Sporophytes are not present on plants of this species found in coastal BC, though they are present in other locations (like Britain). 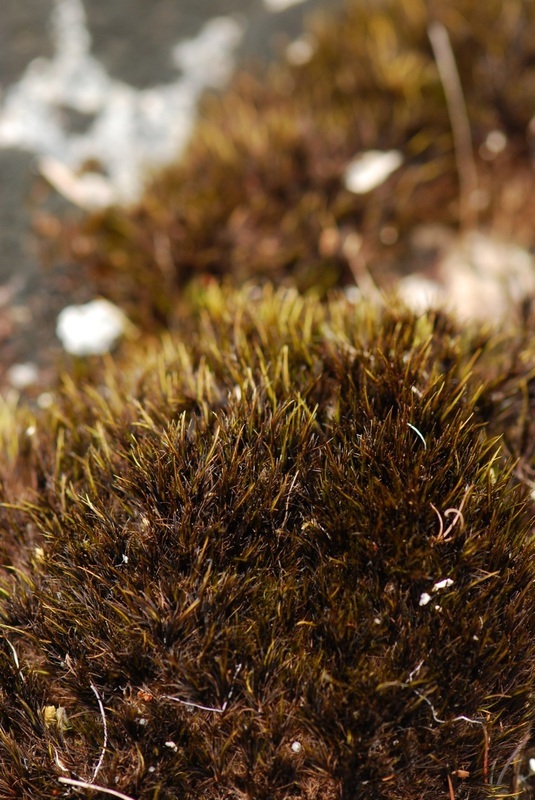 Black fish hook moss forms cushions and mounds in coastal peatlands. It is found along most of coastal BC; distribution south or north of the province is not well documented. It occurs in Britain as well, where it also has a coastal distribution and grows in wet, peaty or acidic places. It has been recorded in other parts of Europe as well as Asia. There are five other Campylopus species recorded in British Columbia, all of which have coastal distributions as well as broad midribs and concave leaves. Black fish hook moss is the most common, and is distinguished from the other species by details that require a microscope: clear leaf tips and inflamed, reddish alar cells found at the bases of leaves where they join the stem. Campylopus atrovirens De Notaris, Syllab. Musc. 221. 1838. eFloras. Flora of North America. Accessed 06/10/2014. Pojar, J. and MacKinnon, A. (1994). Plants of Coastal British Columbia. Vancouver, BC: Lone Pine Publishing. P. 481. Rothero, G. Campylopus atrovirens. British Bryological Society. Accessed 06/10/2014. Vitt, D. H., Marsh, J. E., and Bovey, R. B. (1988). Mosses Lichens & Ferns of Northwest North America. Vancouver, BC: Lone Pine Publishing. P. 129. Kelly Fretwell, Ian Cruickshank, and Brian Starzomski (2014).